‘ANP-0131’ was the most vigorous and productive of the three scions, and yielded over 80 t/ha in fifth-leaf (2017/18, dependent on rootstock). ‘ANP-0118’ and ‘ANP-0534’ had lower yield potentials and produced a maximum of 49 t/ha in their fifth-leaf (dependent on rootstock). Average red coverage of individual fruit was typically 30, 40 and 50 % for ‘ANP-0118’, ‘ANP-0534’ and ‘ANP-0131’, respectively. Results showed that ‘ANP-0131’ and ‘ANP-0118’ bear fruit predominantly on spurs, followed by terminals with a small proportion of fruit borne on axillary buds. There was little difference between terminal and spur fruit in size or quality (red coverage and intensity, firmness, and soluble solids concentration). Axillary fruit tended to be smaller (‘ANP-0131’ and ‘ANP-0118’) and had poorer quality (‘ANP-0118’) than fruit from terminals and spurs, although differences were not statistically significant. ‘ANP-0534’ was found to be predominantly spur-bearing. All cultivars were observed to return bloom and return set (a proportion of buds that flowered in season 2016/17 flowered and set fruit in the following season). ‘ANP-0534’ had a return bloom (proportion of buds that set fruit in 2016 and flowered in 2017) of 24 % and a return set (proportion of buds that set fruit in 2016 and set fruit in 2017) of 19 %. Return bloom and return set exceeded 67 and 51 %, respectively, for ‘ANP-0131’ and ‘ANP-0118’. These results are promising but do not conclusively rule out the possibility of biennial bearing due to the poor pollination conditions and subsequent low crop loads for ‘ANP-0131’ and ‘ANP-0118’ in 2016/17. Continued monitoring is warranted. The results support the use of a UAV based assessment for field canopy N concentration using the new M3CI_710nm index. In addition, research was undertaken to evaluate lab based leaf reflectance measurements using a portable spectrometer. Results indicate that reflectance indices (NDVI and NDRE_720nm) measured at the leaf level, with a controlled light source and calibration could be used to estimate leaf N concentration. Over the six years of monitoring in the irrigation experiment, results showed total drainage recharge was 180 mm (cf. the total irrigation volume of 2200 mm) and the total drainage flux of nitrate-nitrogen was 35 kg-N ha-1 (cf. the total nitrogen application of 287 kg-N ha-1) under drip irrigation. Model parameters for SPASMO were fine-tuned from these observations of N applications and flux combined with tree and fruit N content and soil mineralization to simulate realistic yield and nitrogen uptake by blush pears. The model can now be used to develop irrigation and fertilizer schedules for a range of different soil types and climates. Treatments of BA with notching and GA4+7+BA with notching in early October (slight leaf emergence) were found to be the most effective in promoting development of long shoots. Effectiveness of notching alone did not differ from that of plant growth regulators alone. Later application of treatments (31 October, full leaf emergence) encouraged the development of spurs. Fruit set responses to applications of plant growth regulators varied between seasons and cultivars and were affected by application rates. Seasonal variation in response is a common finding. It is likely that plant growth regulators will have no or little effect when environmental conditions are conducive to pollination and set. Risks of use of plant growth regulators include small fruit size, misshapen fruit and poor return bloom. ‘ANP-0131’ was compatible with all tested cultivars (‘Corella’, ‘Ya Li’, ‘Tanzhiya’ and ‘ANP-0118’). ‘ANP-0118’ was compatible with all tested cultivars (‘Corella’, ‘Hosui’, ‘Howell’ and ‘ANP-0131’). ‘ANP-0534’ was compatible with all tested cultivars (‘Hosui’, ‘Howell’, ‘ANP-0131’ and ‘ANP-0118’) and appeared to be self-compatible. Attempts to collect pollen from ‘ANP-0534’ were unsuccessful. ‘Packham’s Triumph’ is thought to be compatible with the cultivars but flowering has not been synchronous in the previous two seasons. All pollenisers tested in this study were synchronous with the respective cultivars in 2017. One block is revealing the effects of drip and microjet irrigation systems, irrigation frequency ('standard' or 'pulse') and root pruning on water status and growth of young pear trees. cultivar and rootstock (referred to as the Rootstock experiment). The pear research orchard will provide a resource for additional research projects. For example, the site will be used to explore aerial platforms for the capture of spatial data on tree water and nutrient status. We envisage that pear yield and fruit temperature models can be tested, insect behaviour can be examined and the effects of elevated CO2 on fruit quality can be investigated. The orchard at Tatura offers opportunities for growers, consultants and education groups to visit the site. 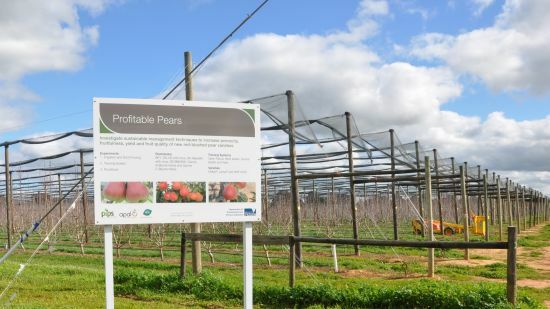 The objective of the Profitable Pears project is to develop orchard management systems for these new pear cultivars to maximise productivity 3 – 4 years after planting and sustain high yields of consistent quality fruit.